The Tallahassee Table Tennis Club meets twice a week at the Northside Community Center. Photo Submitted by Evenson Decosse. Some call it ping pong. Some call it table tennis. Now many are calling it their favorite new sport. Nearly every table was occupied as competitive matches commenced during the 6.p.m, Tallahassee Table Tennis grand opening at the Northside Community Center on Wednesday. All ages were invited to play. Family and friends were welcome to come out for a night of intense ping pong, or beginner lessons for the newbies. Regardless, it was all about having a great time. Logan Zimmerman, head coach of the Northside facility and also a USA Table Tennis certified coach, is an eight-year veteran of the sport. 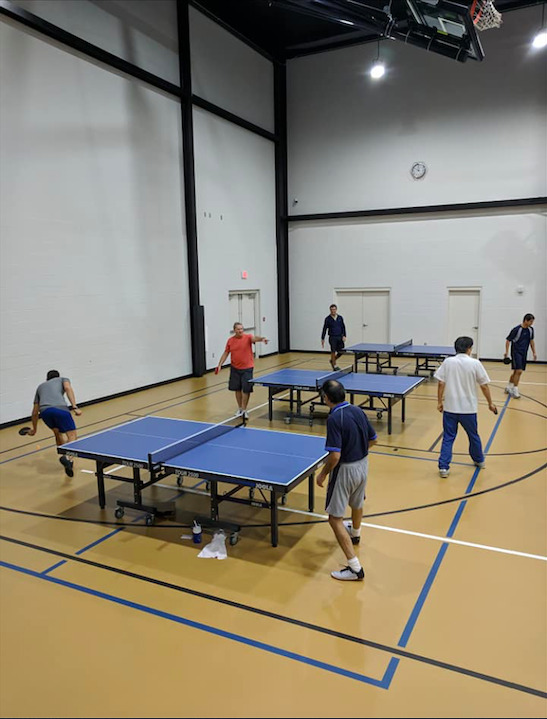 Zimmerman and his co-club director, Willy Leparulo, host weekly sessions on Wednesdays and Saturdays for players to engage and learn more about competitive ping-pong. “I want people to feel like there’s a community, and they’re here to have fun. They don’t have to feel embarrassed as a beginning player, not being able to play at the level as someone more experienced is welcomed here." "The interesting thing is, there’s always competition for them. They can grow in that beginners group instead of feeling out of place,” said Zimmerman. The objective is to have a community that fosters all levels within the club and large enough where every participant feels that they have a group of peers that they can play with. “For one, we want to incorporate intro to table tennis classes. Teaching the different strokes of the game and the other ways you can improve quickly, and also team leagues that comprise of multiple levels. That way more people can come out and bring friends to have a good time,” Zimmerman said. The center has several after-school programs, a multipurpose sports floor and is equipped with coaches who specialize in various activities. With so many local residents frequenting the Northside Community Center, the potential to grow the Tallahassee Table Tennis Club seems boundless. “I think the table tennis club is awesome. It’s a good way to bring community together, which is actually the point of the center when you think about it, to bring community together. Every time they have an event new people come in," Teresa Hand, the center’s assistant manager, said. "I watch as they meet new players, while others get coached and honestly they look passionate about it,” Hand said. Turner, who plans to come back for another night of table tennis, can attest to the fact that Zimmerman and his club have afforded a safe space for players in the community to come out and learn, compete and most importantly, socialize.